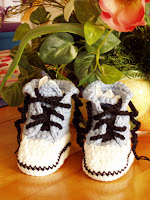 Had a baby shower to attend yesterday…she’s having a boy and I was wishing for a reason to make these adorable converse booties for someone. The pattern is from the Sept/Oct 2007 Crochet Today (a super crochet mag, by the way). The first one I made would’ve fit a two year old. Arrghhh… I’m forever using a different yarn than what is called for and I love using cottons and what I have on hand (lots of Lion Brand’s Cotton Ease). I just did not adjust the pattern enough. 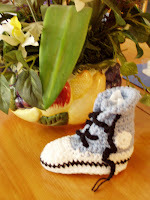 So my second attempt turned out just right–about a 3-6 month old size. They say it’s an “easy skill” pattern, but I would call it intermediate due to the construction with multiple pieces. But it’s a well-written pattern. My youngest girl suggests I make the next ones in pink, and purple and lime green…great idea!